If borrowers have been deliberating whether to refinance existing CRE debt, today’s market conditions present an excellent opportunity to lock in long-term debt. You may have recently heard talk about the yield curve flattening – in this instance, short-term government rates have crept up within shouting distance of the 10-year Treasury yield. The last time the spread between the 10T & 2T notes (as of 4/25: 0.53%) has been this narrow was April 2005. Although the flattening yield curve is inviting discussion from market experts about possible inversion, the current flatter curve provides a long-term CRE investor with a terrific opportunity to refinance existing floating-rate debt. Therefore, if a borrower has a floating-rate loan tied to a LIBOR index (absent a LIBOR cap), a borrower may see its interest rate rise by nearly ¾ of a percent, one year from now, per the forward curve. If this loan was originated one year ago, the borrower has already seen its cost of capital notably increase due to the 2017 rate hikes. For example, a floating-rate loan originated last year (April 2017) could have reasonably been priced at 30 Day LIBOR + 3.00%, representing an interest rate of approximately 4.00%. Today, that loan’s interest rate is approximately 4.90%, and one year from now, the interest rate is projected to be 5.60%. Yikes, that’s a notable upward tick in the borrower’s cost of capital! If a borrower’s business plan is to divest the real estate asset at loan maturity, then an interest rate cap or SWAP agreement may take some sting out of the rising rate environment. But if a borrower intends to continue to hold onto the asset after loan maturity, then the borrower should consider taking the risk of a rate increase off the table now. And given the relative flatness of the yield curve, refinancing into 10-year fixed-rate money might be very attractive – as the new rate could be lower than the existing loan. For instance, a floating-rate loan originated in January 2017 with an underwritten debt yield of 10% and 55% – 60% LTV may have been priced at LIBOR + 2.35%, which equates to a current rate of roughly 4.25%. Pricing in today’s environment for a 10 year, fixed-rate loan would price very similarly, if not lower. But we do not know how long this pricing phenomenon will last, considering CRE pricing for long term loans (10+ years) is highly sensitive to corporate bond issuance. Lately, investor appetite for corporates have been strong, which have kept their yields modest, and in turn kept CRE lenders honest with similar yields. However, should corporate bonds spike like in late 2015, then CRE lenders will likely increase their rates accordingly in order to remain attractive to the bond and paper buying community. The 10T recently reached 3.00% this week, which was last achieved in early 2014, and market pros Pensford Financial believe the 10T yield could reach 3.25% by year’s end – so upward pressure on yield is expected. 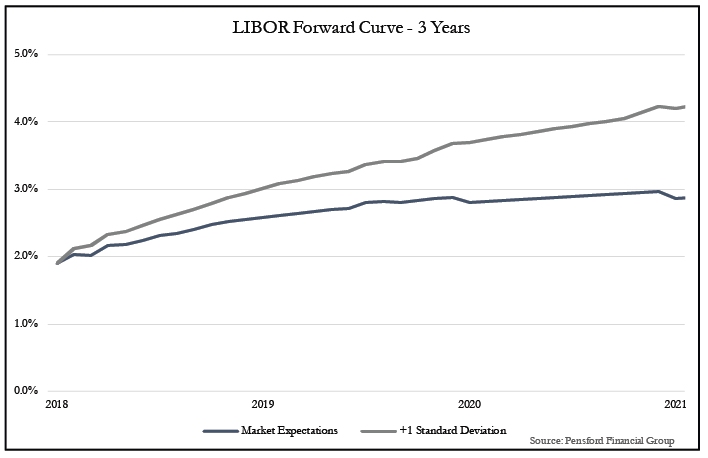 Taking rate increase risk off the table now could also pay dividends if the above-mentioned forward LIBOR curve is reasonably accurate. Staying with our example, if the existing floating loan’s interest rate is currently 4.25% and the new fixed loan is priced at 4.20%, each with a $10 million loan balance, then the floating-rate loan will end up costing substantially more in interest expense as time progresses. The table below illustrates an example assuming 24 months of term remaining until the floating-rate loan matures. In this instance, it shows that refinancing early saves the borrower approximately $97,000 of interest expense. Some floaters have an early prepayment penalty, and in this example, the interest expense savings could absorb a penalty up to 1% of the loan amount. In this case, refinancing early not only hedges against rates spiking in the foreseeable future, but is also justifiable in the P&L as it reduces interest expense. Recent tax reform, economic data and Fed monetary policy suggest we are entering the next stage of macroeconomic conditions. That higher-rate environment we all have been underwriting for the last few years could be at our doorstep. Real estate operators will likely face stiffer headwinds than those experienced during the last few years, but refinancing early into long-term debt should abate some of that resistance. Robert Murphy is the Senior Vice President of Structured Finance for Transwestern.